The candidates for Cincinnati City Council and Mayor have faced off in a number of debates and forums over the past several months. However, one forum being held tomorrow will be of particular interest to readers of UrbanCincy. 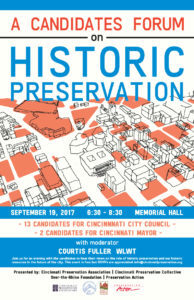 The Candidates’ Forum on Preservation will focus on historic preservation and related subjects, including policies on new development in historic neighborhoods. Fourteen city council candidates and both mayoral candidates will be in attendance and answering questions on these topics. “The forum will discuss the role historic preservation plays in other important city issues, such as planning, neighborhood revitalization and economic development,” said Rob Nayor, Program Manager for Preservation Action. Courtis Fuller of WLWT will serve as the host of the forum, which is being presented by Cincinnati Preservation Association, Cincinnati Preservation Collective, Over-the-Rhine Foundation, and Preservation Action. Candidates will not be ranked or endorsed based on their views. The event is meant to be informational and to allow the public to understand the candidates’ views on these issues. The event will be held on Tuesday, September 19 at Memorial Hall, and will start promptly at 6:30 p.m. 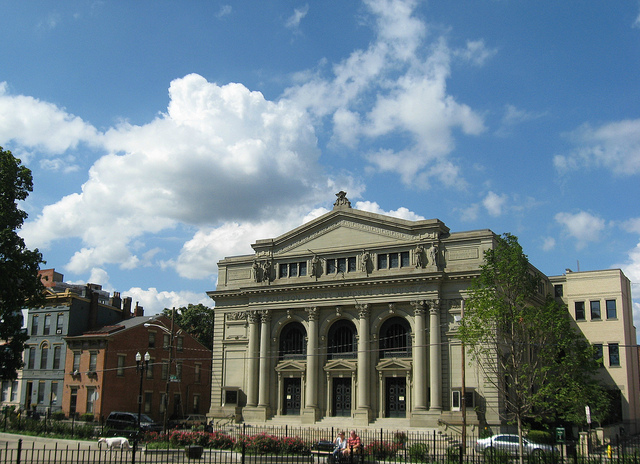 The venue is accessible via Metro routes 21 and 64 on Elm Street; routes 1, 6, and 20 on Central Parkway; the Cincinnati Bell Connector stop at 14th & Elm; and the Red Bike station at 14th & Elm. Parking is also available in the Washington Park Garage.